Yesterday, a new review of The Story of Snow appeared on Bookends, a Booklist blog. 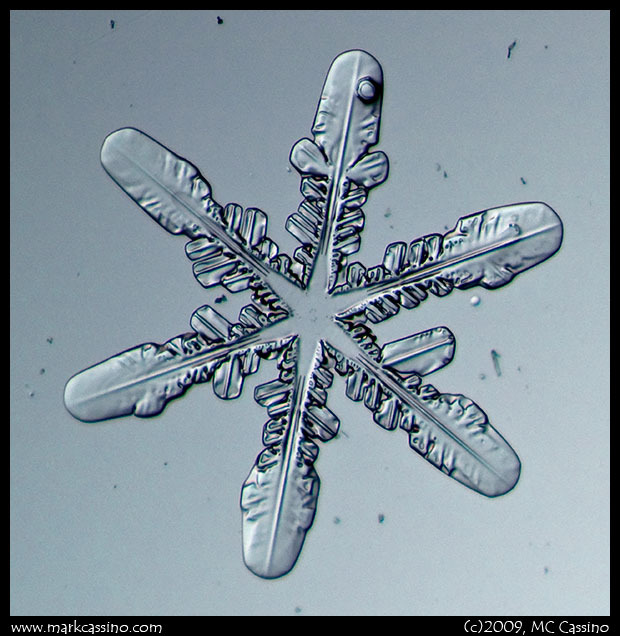 Back when I lived in Boulder CO, I worked with Charles Knight on developing a new way to grow ice crystals for experimental study. I knew that the problem with most methods was twofold: there were too many crystals too close together to be able to learn how each one behaved on its own, and the surface that held the crystal would influence the crystal’s growth. Charlie hit on a great way to eliminate the first problem: put some water in a small pipette (like a narrow, tapering straw) and freeze the water from the wide end. At the tip, which stuck out into a small observation chamber, ice would grow out as a single crystal. Unfortunately, the smallest pipette tip was about a millimeter in diameter, which is too large. I then tried using Dupont hollowfill fibers, which are about 20 times thinner – about as thick as fine human hair. But this was still too thick. So I started using glass capillaries, which I could heat with a small torch to draw down to sizes 100-1000 times thinner than the pipette – about as thin as small cloud droplets before they freeze into ice. We had our method. From the start we would see things that hadn’t been reported before. Some of these things we (or I) published, but most of the things still remain unpublished. One of them is the heart-shaped crystals. 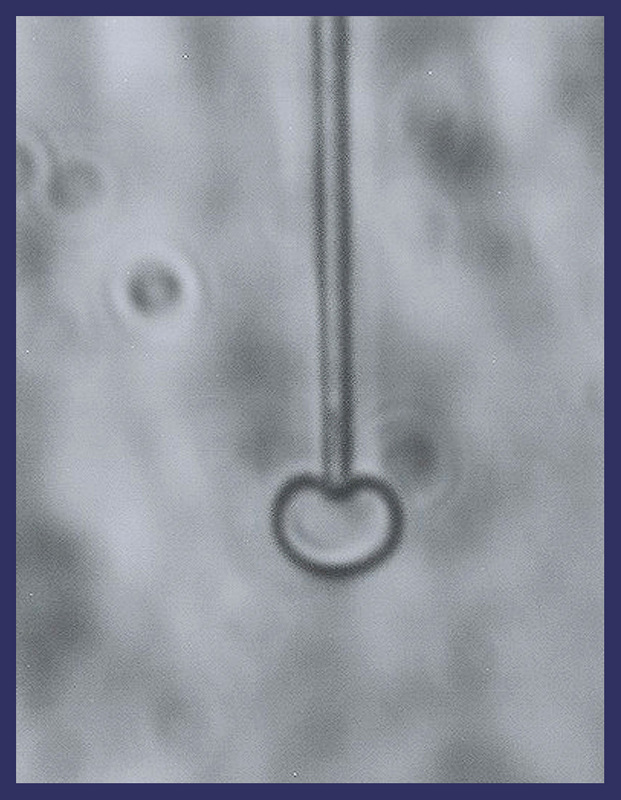 The photo below shows the tip of the capillary, which is about 10 times thinner than human hair, along with a thin heart-shaped crystal. After the heart grew a little more, it developed into a hexagonal shape. But probably the most bizarre thing I saw occurred when I decided, just for kicks, to try to evaporate ice from the inside of a crystal by connecting the wide end of the capillary up to a vacuum pump. About the time I was typing “It’s snowing like mad” last night, it stopped snowing. A feeble mid winter sun greeted us early this morning, and then the clouds rolled in and brought an exceedingly light snow. Come evening, barely half an inch of fresh snow lay on the sidewalks and the car windshields. I had checked the snow throughout the day only to find it to be tiny, crunched-up bits of dusty ice. But stepping outside this evening to grab a log for the fireplace, I was surprised to see that the dust had given way to some very nice snow crystals. Here’s another shot from tonight – the little specks all around it are the ‘dust’ I as referring to early – tiny bits of eroded snow crystals. They make the main subject look quite large – but it was well under 1/16th of an inch in size. More shots will be coming in the next few days. A hole in the ground is a good place to look for large hoar crystals. Next to some rice paddies, just uphill from the tubs, lies a few small holes in the cement roadway. From eye level, the white tinge of hoar frost just inside the lip is easily overlooked. Indeed, the hole pictured below is slightly less than 3 cm across at the widest and I sometimes have to look twice before I notice the ice. 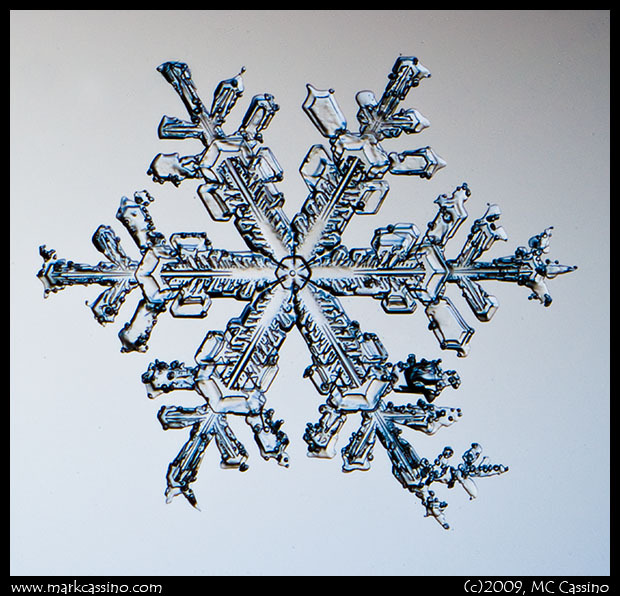 Like snow, hoar can grow as a thin plate, a thin dendrite, a long column, a sharp needle, or some intermediate form, except hoar generally grows out in only one direction, not the six directions of the snow crystal. The ground surface here can dip slightly below freezing, but a short distance below the surface lies warmer, often moister, ground. At such temperatures (i.e., within a few degrees of freezing), both snow and hoar grow into platelike, or tabular, forms. 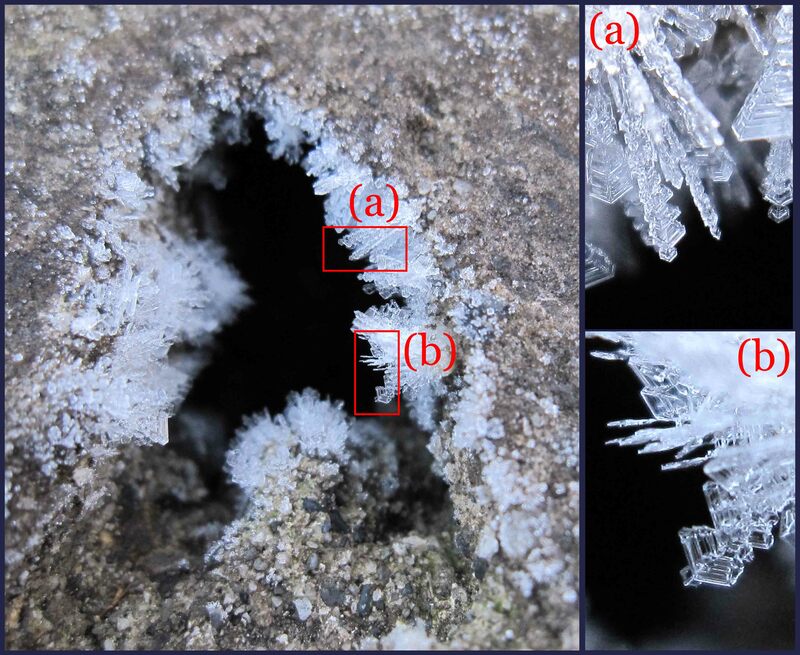 Even when nearby blades of grass or foliage have columnar hoar crystals, the hole usually has tabular, showing that a small change of temperature changes the crystal considerably. (The dendrite, the most extreme tabular crystal form, grows at temperatures even lower than the columns.) (a) shows a few long, narrow crystals with jagged edges like a sawblade. 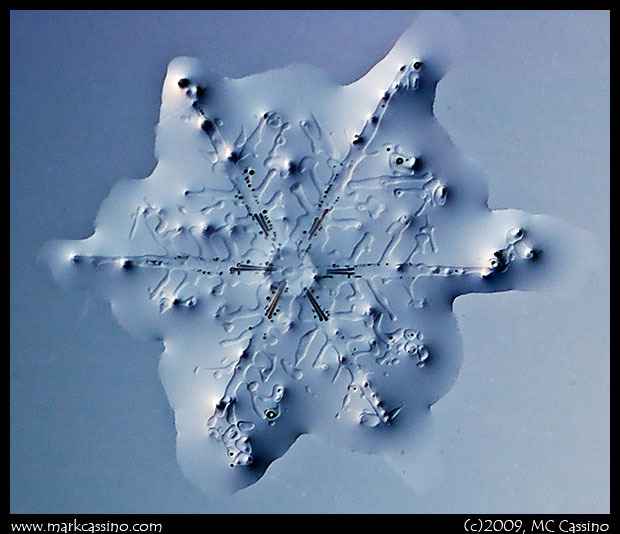 And like a sawblade, these crystals are thin, as some of the side-views in (b) show. I often see curious ice patterns on the surface of frozen water. On Christmas morning, I saw this strange pattern on one of the farmer's outdoor bathtubs. The foreground region looks a little like terraced rice fields on both sides of a mountain pass, but each terrace seems to have a structure like veins on a leaf. 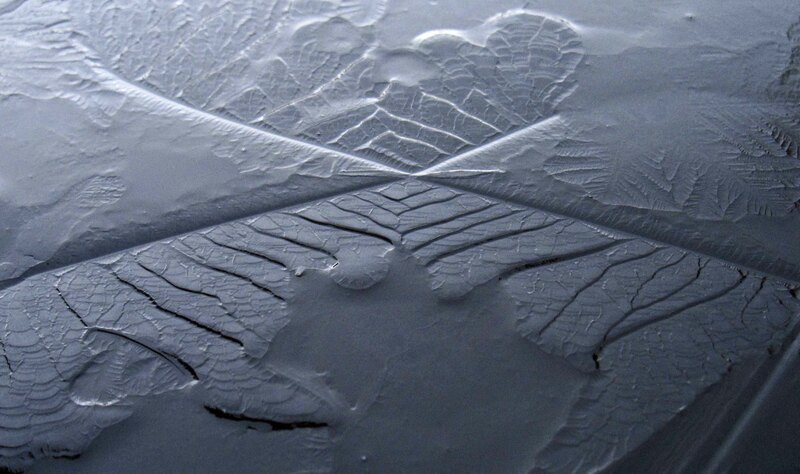 Indeed, the pattern within the 'mountain' on the right looks very much like a leaf. I have no idea how these patterns formed. The image is about 3 cm across. On my morning icespotting trip the other day (12/23), I caught a glimpse of an unusual sight - a sun pillar. I thought I saw one once last winter, but this one was unmistakable. It seemed more striking even than the one in Robert Greenler's book "Rainbows, Haloes, and Glories", a classic book on atmospheric displays. A line of light above the sun forms when sunlight reflects off the bottoms of falling crystals that fall a certain way - nearly horizontal. A pillar can form from either columnar crystals, oriented like a log floating on water, or tabular crystals, oriented like a frisbee in flight. For the reflection to reach our eyes, only the crystals that appear above the sun can reflect sunlight to our eye. So we see the reflections coming from the region directly above the sun, as in the picture. 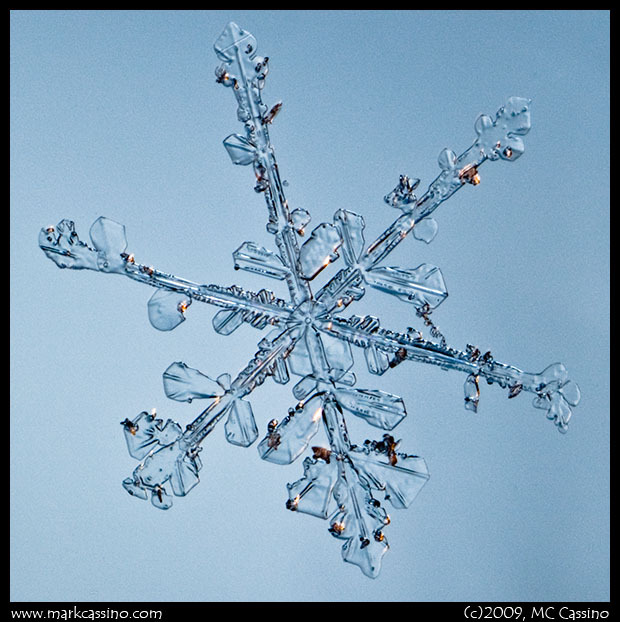 The same effect can occur below the sun, when the sunlight reflects of the tops of the crystals. I took this picture on the sunset setting of my camera, which boosts the reds, but the view to my eye was, if anything, more stunning. Our first snowfall this season came overnight with a howling westerly, but left just a light dusting. Only certain surfaces with a wide view of the sky were cool enough to preserve the snow. The only place in our yard was the roof of our car, which I've found in the past to cool about 8 degrees Celcius below that of the air at head-height. But looking out our window this morning (the 19th), I saw something else that came down - a spider. It might have come from the telephone wire about 30 feet above the car, or, with all the wind, might have blown in from a more distant place. 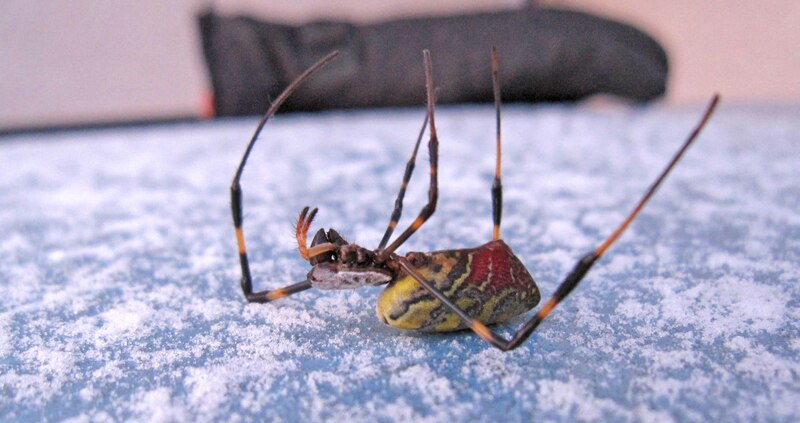 We see these colorful spiders on their webs all over our yard and have come to view a few of them as familiar friends. The one near our front door last year seemed to freeze up and die when the first cold weather came, but later, after being warmed by the sun, popped back into action. I set this fallen spider out in a warm and dry spot, but alas, it did not recover. Around midnight, a gentle snow began to fall. It continues to come down, but the air temperature is still hovering right at the freezing point. 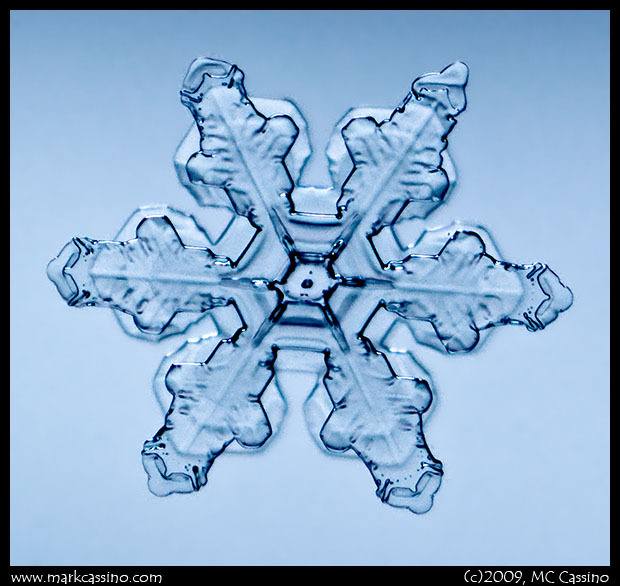 Throughout the night I’d wake up and peek out the window to see snow falling onto wet streets – it was just a bit too warm for the snow crystals to not melt when they hit the pavement. Come morning, the roads were slushy and slick, but the temperature remained stubbornly warm. You never know till you try, so I caught a few falling flakes to see if I could get their photos. They began to melt the moment they landed on the glass plate, and by the time they were positioned beneath the camera lens, they were well-nigh gone. Here are two faces of water - crystal and liquid forms - together in the same place, briefly. These are not the only two forms of water, of course, but it's interesting to see them juxtaposed like this. Last week’s storm brought several inches of hard driving, wet snow to Kalamazoo. But after the blizzard passed temperatures grew more mild, and soon patches of grass began to emerge from the melting snow cover. A slight dusting of lake effect snow a couple of days ago is all we’ve seen of the white stuff since then. I spent a few disappointing hours out in the light snow, catching only highly irregular crystals and the broken arms of dendrites. Here’s the one and only whole crystal I managed to photograph – it’s a start!